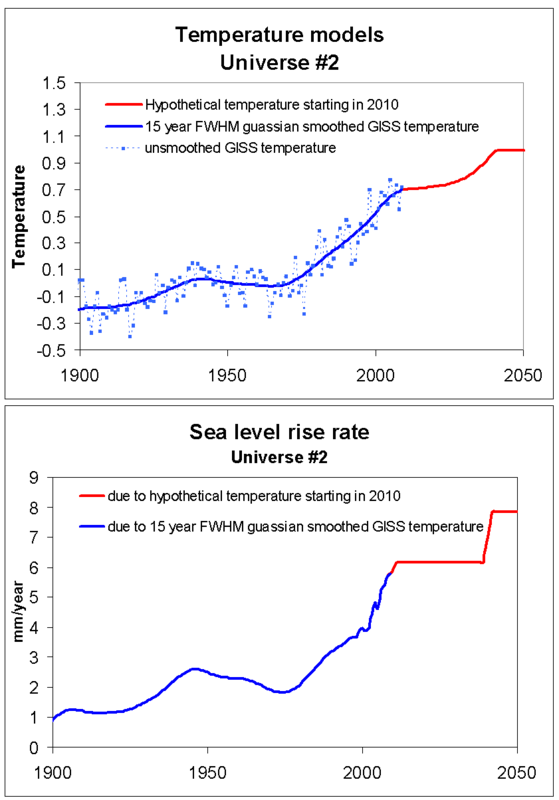 Let’s consider Vermeer and Rahmstorf’s equation that relates sea level rise rate to temperature again. You can read Vermeer and Rahmstorf’s PNAS paper (referred to as VR2009 for the rest of this post), Global Sea Level Linked to Global Temperature, here. Let’s think in terms of parallel universes, just for the fun of it. Both Universes will be the same as the one we live in up to this point. Starting in 2010 they will continue as the same universe with a hypothetical increasing temperature scenario for the planet earth. I will choose a temperature scenario that satisfies equation 4, from part 2. The advantage of this temperature scenario is that the increasing temperature yields a perfectly constant sea level rise rate when applied to VR2009’s equation (equation 1, above). Other than that, there is nothing special about this scenario, but it is convenient to work with for illustrative purposes, and in and of itself uncovers some of the bizarre nature of VR2009’s model. After another 30 years, our universe will bifurcate into two parallel universes. One will continue to have an increasing temperature due to all the nasty undertakings of the human scum that occupies the planet. The other will experience a divine halt to the temperature rise, probably due to the mercy of Gaia after receiving years or prayers of intercession from faithful environmentalists. In this second universe, the temperature will become constant. How will the sea level rises in these two universes compare? Look closely at what happens in 2040, when the two universes split. 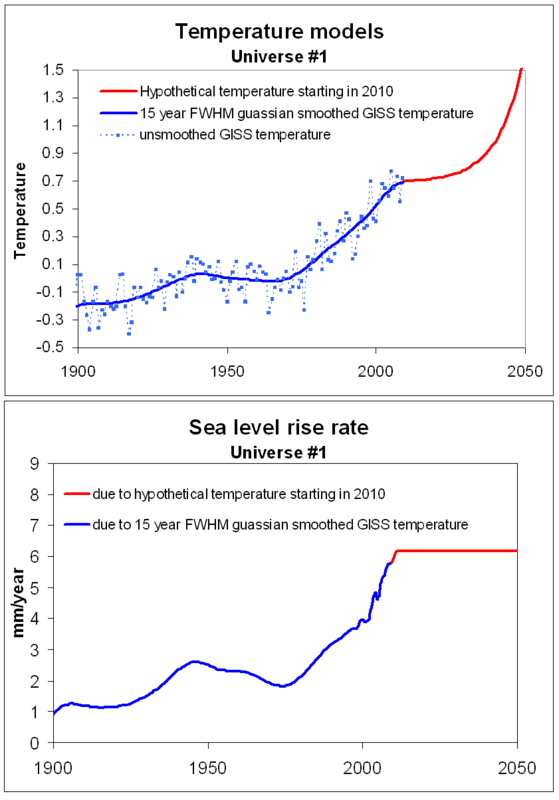 In Universe #1, where the temperature keeps increasing, the sea level rise rate remains constant. But in Universe #2, where the temperature becomes constant, there is a sudden rise in the sea level rise rate. positive, but time-lagged, sea level response. That a negative b corresponds to a lag is easily seen… Several mechanisms could be envisaged for a delayed onset of sea-level rise after warming. For example, mass loss of ice can be caused by warm water penetrating underneath shelves, triggering their collapse and subsequent speed-up of outlet glaciers banked up behind the ice shelf. We cannot explore the causes of delay in more detail here, but note the statistical result is robust irrespective of causes. So, in both universes, water was penetrating underneath the ice shelves. Drop for drop, molecule for molecule, the water penetration was identical. The condition of the ice shelves in the two universes were identical at the moment of bifurcation. In the universe where the temperature continues to rise the ice shelves do not collapse, as evidenced by the fact that the sea level rise rate does not increase. This is despite the fact that the increasing warmth would cause even more water to “penetrate underneath shelves.” But in the universe where the temperature becomes constant, the ice shelf immediately starts to collapse, increasing the sea level rise rate. OK, sure. It’s too bad that VR2009 “cannot explore the causes of delay in more detail,” because I would love to hear how they explain the bizarre results that follow from their model. My conclusion is that their model is bogus. As such, it has no predictive power for sea level rise rates for the 21st century.